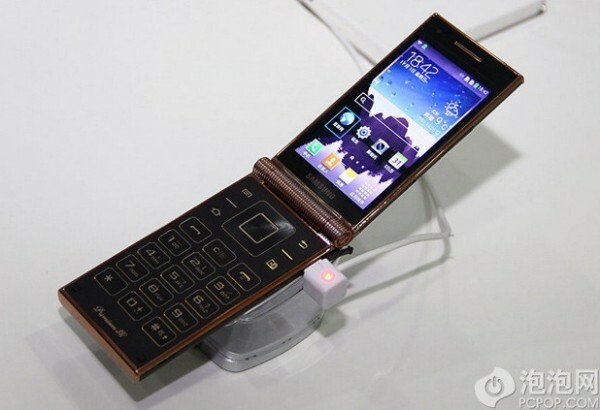 Samsung has introduced a new flip Android smartphone, the SCH-W2014 with amazing specs. The phone is successor to Galaxy Golden which was recently launched in India. It is the first flip smartphone in the world to have Qualcomm Snapdrgon 800 CPU with dual screen Display. The new Samsung W2014 is powered by 2.3GHz quad core processor paired with 2GB RAM. It packs with a 13 -megapixel shooter and a 2MP front facing snapper. It supports DUAL SIM cards and has 32GB internal memory with further expansion via microSD card. It houses 800×480 pixels resolutions 3.7 inch Super Amoled Dual Displays. To make the handset alive there is 1900mAh battery and weighs 173.5 grams. The official launch date and price of the W2014 is not announced yet.